Jongomero Camp is a luxury safari camp set under shady ebony trees on the banks of the Jongomero Sand River in the remote south-western sector of Ruaha National Park. It has excellent food, service and guiding. Due to its remote setting, few other vehicles are seen here, so you will feel you have Ruaha to yourself. There are eight large and well-appointed tents under enormous thatched roofs. Each tent has huge dhow wood beds and polished wooden floors. The large en-suite bathrooms have twin hand basins, and spacious showers. and at the front of each tent is a wide private viewing deck with comfy seating overlooking the river (which is sand for most of the year). The dining and living areas are on raised decks under thatched roofs. The lounge has sofas and coffee tables where you can relax between game drives. Meals are taken both in the covered dining area or, more commonly, outside. The chef serves international meals with an East African flavour. Just away from the central area is a filtered swimming pool with towels and loungers provided. Ruaha is a superb wildlife destination. Days will be spent on game drives in open game vehicles with a maximum of 6 people, and you can also take nature walks with am armed guide and park ranger. Fly camping and walking mobile safaris may be available from the end of July to November, depending on local conditions. These need to be booked in advance. READ AMANDA'S BLOG: Tribes' director Amanda Marks stayed at Jongomero in June 2018. You can read her blog about this for a personal view of the camp experience. Open: Jongomero Camp is open from June till mid-March. Location: Jongomero Camp is in the south of Ruaha National Park. It is on the banks of the Jongomero River and is the only camp in the area. There is an airstrip just 10 minutes’ drive from the camp. Rooms: There are 8 spacious tents set on raised decks with makuti thatch roofs. They have large wooden beds and furniture made from reclaimed dhow wood. The wide front verandas overlook the river and have chairs and day beds. The en-suite bathrooms have showers and twin hand basins. Toiletries are provided. Activities: Jongomero offers morning and afternoon game drives in open 4x4 vehicles and game walks with a professional guide and a national park ranger. This is a good area for bird watching, with some 530 species having been recorded. Fly camping can be arranged from August to November subject to weather conditions. This needs to be booked in advance. Facilities: The communal lounge, bar and dining areas are under thatch and set beneath the shade of an ebony tree. Meals are also eaten al fresco and picnics can be arranged. The lounge has comfy sofas and a collection of coffee table books, a lower deck looks out over the dry Jongomero River. There is a curio shop. The camp has a swimming pool, sun loungers and parasols. Dining: Meals are taken at individual tables, though communal dining can be arranged if guests are in agreement. Children: Children over the age of 6 are welcome, although there are no special facilities for children. The camp is unfenced and animals do wander through, so children must be kept under surveillance at all times. Communication: There is Wi-Fi internet access by the pool are limited times, usually between 11am and 3pm. Spend time in two of Tanzania's finest but less-visited game reserves followed by several days at a gorgeous coastal lodge on the Indian Ocean. 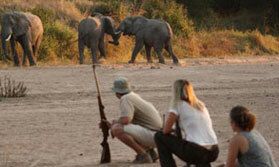 "Ruaha is remote, but if you want remote within remote, choose to come to Jongomero. There are no other camps around here currently (2018) so the only other people you will see are people from the camp, and that only takes a maximum of 20 guests. It’s friendly, very comfortable indeed, with great food, and it even has a pool (and WiFi for 4 hour’s a day, if that is important to you). I loved the bush scenery backed by mountains, the wildlife viewing was great (though to be fair, other areas of the park can be easier for wildlife spotting if you don’t mind more people), and I felt quickly at home. I recommend it without reservation – well, only one, you need to be prepared to accept some tsetse flies in this region (not in camp), though they really didn’t spoil my stay." "Again excellent - layout of tents very good indeed with nice porchway where teas/coffees could be left for you in the morning. Excellent management and staff couldn\'t do enough to please. Also outstanding walking safari with Emiel. Dining on the river bed was an experience not to be forgotten nor were the surprsie breakfasts." "As Siwandu- plenty of activity"